Chester Walls is an exceptional first collection. These are lyric poems and historical narratives of the highest order: expansive, impeccably controlled, assured, and full of an imagery that lingers long in the memory. Every page is its own treasure. 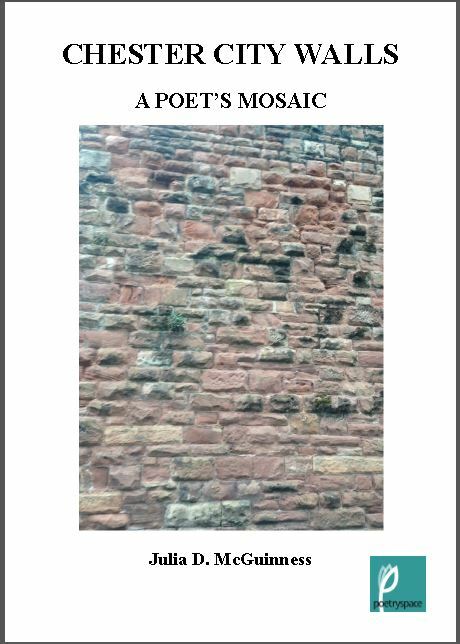 They are poems of place, built, like the Walls themselves, piece by piece, and with a chisel-like intricacy, mapping centuries of lives lived and imagined, and how their shadows continue to bear upon us now. brows frozen over apple cheeks. on the mantelpiece of Eastgate Wall? of fire you held at Eden’s gates. at peace, you chaperone time for all comers. sprouting sky-blue wings for ears? on the clock-face, beneath your eyes. aching your brains with the throb of time. of the Walls’ passing hours. of beaming Japanese or gawky teenagers. watching us walk under time’s shadow. whispers adrift on the air. do they draw from earth? Fragments of old tools, letters? tang of dried secrets, tears?